First, parboil a large cabbage, then let it cool and drain while you prepare the filing. To make the filling, saute one chopped onion along with several chopped ribs of celery and a chopped carrot or two in plenty of butter or ghee. Add meat, which can be any leftover meat or raw ground meat and mix in until heated through (for leftover meat) or cooked (for raw meat). Season with whatever seems appropriate for the meat that you are using (I didn't season my filling because the corned beef was so flavorful). Preheat oven to about 350 degrees. 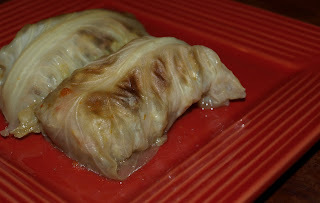 To assemble the cabbage rolls, carefully peel off a leaf from the cabbage, then place a spoonful (or so) of filing in the middle and roll it up. In the photo, you can see that I've rolled them with the vein down the back. Once they are closed, place them opening-side down in a shallow baking dish (preferably with a lid). Keep rolling until you run out of leaves or space in the pan. I ran out of filling first, so I quickly sauteed up some mushrooms and onions in butter for the last leaves- they were so good! Pour some broth over the top of the rolls (so it comes maybe halfway up the rolls? ), then cover and bake for 20-30 minutes. Remove lid and bake another 15 minutes or so if you'd like them browned on top (otherwise simply bake about 45 minutes). If you can have yogurt or kefir you should definitely serve some along with these!